Until recently, seismic images from below deep salt formations were muffled and largely useless. New advanced mathematical formulas and other new technology allow interpreting the images, bringing potential new discoveries of oil and gas from the depths of the ocean. Chevron Corp. and partners Devon Energy Corp. and Statoil ASA have initiated this new technology to explore further into the Gulf of Mexico. Located 270 miles southwest of New Orleans, is the region of exploration by the Consortium, named Jack Field. It is a 300-mile-wide swath of the Gulf that lies below miles of water and deep within a bed of ancient rocks. Using newly designed floating oil rig platforms, which can withstand the regores of Gulf storms and drill deeper than their predecessors, they have met success. On September 6, 2006 the Consortium announced that they might have discovered America's biggest source of oil since the discovery of Alaska's North Slope more than a generation ago. Below 7,000 feet of water the drill bit went through a total of 28,175 feet, or a distance of 6.6 miles from surface of the drilling platform. The Consortium stated that the well sustained a flow rate of more than 6,000 barrels of crude oil a day during the production test. 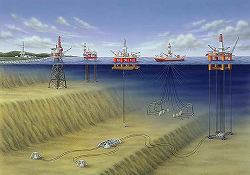 The Jack 1 and Jack 2 are among the world's deepest off shore production wells. The costs according to industry officials is a staggering $100 million! According to one company official, "Without current price of oil this project would have never been affordable." We share professional crude oil price intelligence, research and insights. Unsubscribe at any time. 60,000+ people are now receiving our research.